The Bank of England’s Monetary Policy Committee (MPC) last changed interest rates in March 2009 when the official interest rate was lowered to 0.5% where it has stayed since (which suggests that this may be the perceived effective lower bound on nominal interest rates). At the same time, the Bank of England began to make purchases of financial assets direct from the non-bank financial sector. The MPC began with £200 billion of asset purchases, mostly UK government debt, between March 2009 and November 2009. It then increased the stock of asset purchases to £375 billion in three increments (£75 billion in October 2011; £50 billion in February 2012; and £50 billion in July 2012). While there have been no further purchases of assets for over three and a half years, the returns and proceeds on maturing bonds have been reinvested, which means that the outstanding portfolio of purchased assets is £375 billion. This form of monetary policy, know as quantitative easing (QE), was unconventional because it consisted of large purchases of government bonds of long maturities funded by interest-paying reserves. Textbook conventional open market operations instead consist of purchases of short-term bonds in small quantities, paid for by currency or non-interest paying reserves. Moreover, QE purchases of long-maturity assets are executed for reasons other than the implementation of a decision to change the (short-term) policy rate. Similar unconventional policies have been adopted by other central banks at times over the last seven years, although other central banks went further by also buying many other non-government issued securities and/or lending against a broad set of collateral for long periods of time. Such forms of unconventional monetary policy have become so common that they have been called ‘conventional unconventional monetary policy’. There has been active research on the effects of QE policies. Most work finds that QE increases the prices of the assets that are bought, lowers long-term interest rates, and decreases expectations of future short-term interest rates. The effect of these policies on inflation and real outcomes are more disputed, as are their effects on financial stability. The classic references that started the literature are Gagnon et al. (2011) and Krishnamurthy and Vissing-Jorgensen (2011) for the US and Joyce and Tong (2012) for the UK, while Rogers et al. (2014) provide a review across countries. There is disagreement about the current strength (or weakness) of economic conditions in the UK and elsewhere, and therefore on the desirability of further monetary stimulus. 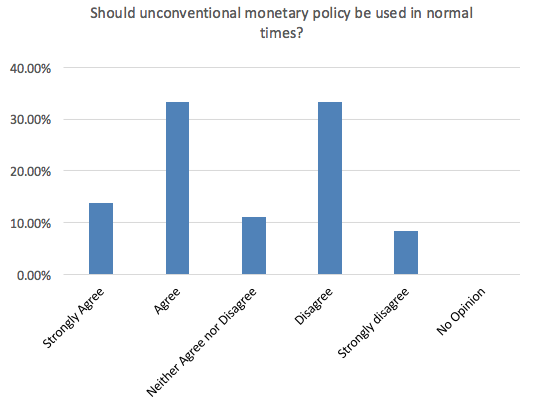 The first question in the Centre for Macroeconomics (CFM) survey asked the experts to set aside their views as to whether the current state of the economy warrants the use of further unconventional policies, and asked them to consider whether these unconventional policies should become part of the conventional tools of monetary policy under ‘normal’ economic conditions. Figure 1. Should central banks use unconventional monetary policy in ‘normal’ times? Some economists have expressed concerns that there are economic conditions under which existing tools, including unconventional monetary policy tools, are not sufficient to achieve central bank objectives. In fact, some have argued that current conditions warrant more innovative tools being introduced. These ‘unconventional unconventional policies’ include the financing of public spending (or tax cuts) through printing money – the idea that was called ‘helicopter money’ by Milton Friedman. These policies also include abolishing currency and setting substantially negative nominal interest rates. Others feel that even if current tools may be enough for now, it is necessary to undertake a more radical rethink of the tools of monetary policy to ensure that the central bank is ready to deal with future crises as they arise. 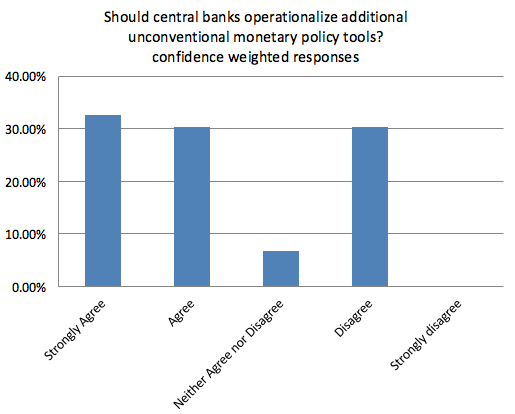 The second question in the CFM survey asked the experts whether they believe that the central bank toolkit needs further new tools to become potential instruments of monetary policy (again ignoring whether they believe current conditions necessitate such instruments). 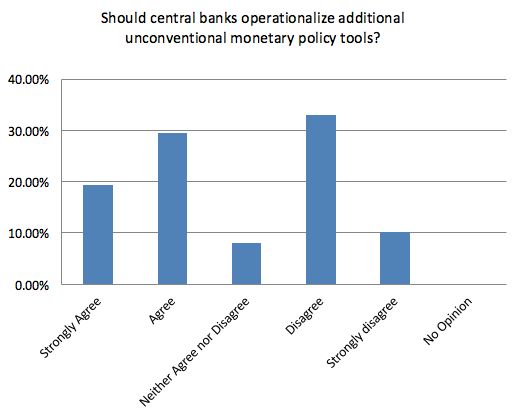 In the context of this question, operationalising the tools means that the central bank takes whatever steps are necessary to add the instrument to their menu of possible policy options, even if no immediate use of the policies is made. New policies whose first objective is financial stability were not be considered in this question. Figure 2. 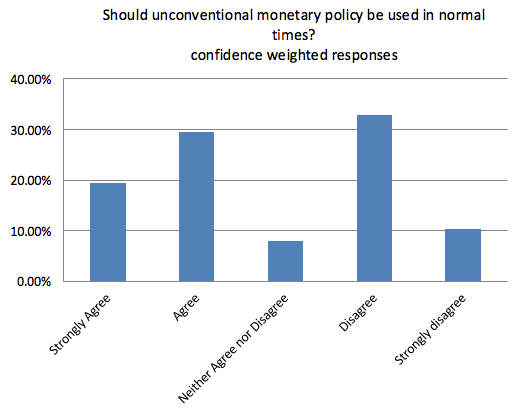 Should central banks operationalise alternative tools of monetary policy? Ethan Ilzetzki (LSE) thinks that these tools, and especially helicopter money, are clearly fiscal operations: “I support the use of fiscal policy as a countercyclical tool, but do believe this should remain within the remit of the Treasury. Helicopter money may be a way to exploit the Bank of England's independence to circumvent the political process, but I think this would be unwise.” Kate Barker (Credit Suisse) makes a similar point. Joyce, MAS and M Tong (2012), ‘QE and the Gilt Market: A Disaggregated Analysis’, Economic Journal 122(564): F348-84. Gagnon, J, M Raskin, J Remache and B Sack (2011), ‘The Financial Market Effects of the Federal Reserve’s Large-scale Asset Purchases’, International Journal of Central Banking 7(1): 3-43. Krishnamurthy, A and A Vissing-Jorgensen (2011), ‘The Effects of Quantitative Easing on Long-term Interest Rates’, Brookings Papers on Economic Activity Fall 2011: 215-65. Rogers, JH, C Scotti and JH Wright (2014), ‘Evaluating Asset-market Effects of Unconventional Monetary Policy: A Multi-country Review’, Economic Policy 29.